Here are two of the research projects sponsored by and carried out at the Osa Biodiversity Center in 2009. Friends of the Osa hosted Tyler Reynolds from Purdue University and Ross Eustis from Whitman College this past summer to conduct biochar soil amendment trials in coordination with the Centro Agronómico Tropical de Investigación y Enseñanza (CATIE). Biochar is charcoal created by pyrolysis of biomass, the burning of biomass in the absence of oxygen. The resulting material is a stable solid rich in carbon content, and thus, can be used to lock carbon in the soil for long periods of time. Tyler Reynolds (Purdue University), Gabriela Soto (CATIE), and Stefan Jirka (Blue Moon Fund) filter biochar to use in reforestation trials on Cerro Osa. CATIE will conduct those trials, where different levels of biochar are applied to native tree species and growth rates are tracked to determine the effects of biochar. Biochar is of increasing interest as a carbon sequestration option to mitigate climate change and also for agriculture as it has the ability to improve soil conditions. Tropical hermit crabs roam the dry areas of the beach scavenging for an omnivorous diet and shelter in the form of empty gastropod shells. For the Coenobitidae crabs, food can be hard to come by since it lies scattered across the beach, is concealed by sand and is shifted by the tides. If one crab finds some food, others coalesce around it to grab a bite. Hermit crabs are essentially rugged individualists, so this cooperative behavior happens accidentally. Mark Laidre, a graduate student at Princeton University, is conducting field experiments to study how aggregations of crabs lure solitary crabs to sources of food and shelter. 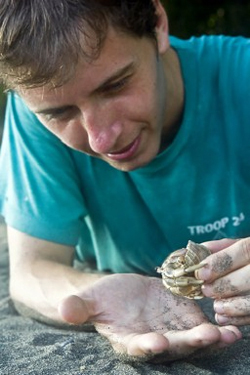 Mark will be following a marked population of hermit crabs, tracking their movements and social interactions day and night, and examining how vital resources like shells are exchanged within the population and are passed down across generations. Photo by Rick Stanley.